Templeton Emerging Markets Group has a wide investment universe to cover—tens of thousands of companies in markets on nearly every continent. While we are bottom-up investors, we also take into account big-picture context. Stephen Dover presents the team’s overview of what has happened in the emerging-markets universe in the fourth quarter of 2017, including some key events, milestones and data points to offer some perspective. The US Federal Reserve (Fed) raised its key interest rate by 25 basis points in December, its third increase in 2017 and in line with market expectations. The Fed is widely expected to raise the rate three times in 2018. Despite increasing concern, the impact of these rate hikes on emerging markets has thus far has been limited, partly because the normalization of monetary policy in the US was anticipated, and also thanks to sound growth and fundamentals in major emerging markets. ͏2. Politics was at the forefront in December as elections in South Africa, India and Chile grabbed investors’ attention. As we step into 2018, politics continue to warrant our attention as three major emerging-market (EM) economies—Brazil, Mexico and Russia—will hold presidential elections. While there is little doubt that President Vladimir Putin will be re-elected for a fourth term, Brazil and Mexico may see a change. With left-wing populist Andres Manuel Lopez Obrador leading in most opinion polls in Mexico, we expect increased market volatility and continue to monitor the situation closely. In Brazil, we expect a favorable outcome with the new president likely continuing to implement key reforms. Emerging markets recorded inflows of about US$80 billion in 2017, compared to minor inflows in 2016 and outflows in 2013-2015. While 2017 was the third-best year for emerging markets in terms of asset inflows in absolute terms, after 2010 and 2009, in more than 20 years, relative to market capitalization, the recovery of flows has been relatively milder. There may be volatility ahead, particularly as investment flows can often reflect ever-changing attitudes to perceived risk, with inflows as investor sentiment moves “risk-on” and outflows as it moves “risk-off.” Even so, major global investors have a lower proportion of exposure to the asset class, below what we would expect given the proportion of global GDP (gross domestic product) and market capitalization that emerging markets represent, and that could support continued inflows. 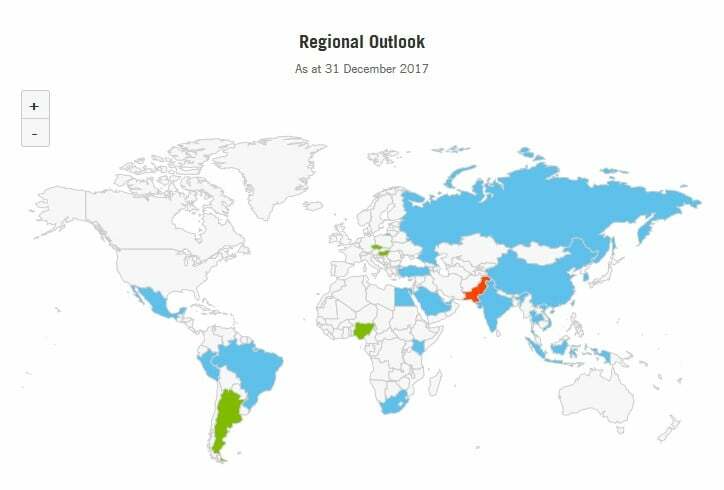 Emerging markets did well in 2017 and we expect the asset class to remain on an upward trend in 2018, against a favorable backdrop of robust economic growth, increased asset inflows, solid foreign reserves, strong current accounts and stable local currencies. Valuations in emerging markets remain attractive, in our view, trading at a discount to their developed-market peers. Earnings of many EM companies have also been gradually improving, in terms of profitability, margins and return on equity (ROE). We believe Asia remains the most exciting EM region. It offers a range of opportunities, from China, South Korea and Taiwan to countries such as India and Indonesia. Asian companies are also beginning to dominate in industries where European companies used to lead. This is especially so in the automobile and auto-related technology industries. Similarly, we are finding opportunities in Latin America. Brazil has emerged from a prolonged recession and faced several challenges, including high unemployment and corruption scandals, but we are generally positive on the possibilities within that market given the new emphasis on reform efforts. As fundamental stockpickers, we are equally excited about individual opportunities in other parts of the world, such as in places like Russia, which has fallen out of favor. In such situations, we are finding companies we regard as extremely well run, growing at a fast pace, and providing exposure to key themes such as economic growth, demographic changes and local consumer trends. Global equity markets advanced during the fourth quarter of 2017. Investors mainly focused on continued indications of positive economic growth from several regions and the progress of tax reform in the United States. However, we did witness a brief correction in the information technology (IT) sector on profit-taking and a rotation into other areas including financials. Asian markets were among the top EM performers with India, South Korea and Singapore recording double-digit returns during the fourth quarter. The ruling party’s victory in two key state elections and expectations of a pro-growth budget in the fiscal year ending March 2019 buoyed market sentiment in India. Equity prices in South Korea were driven by easing geopolitical tensions, solid economic growth and strong appreciation of the won. In contrast, Taiwan was one of the weakest performers as profit-taking in the IT sector and a rotation into materials and financials held back returns. Political instability continued to weigh on Pakistan, where stock prices declined. Latin America, despite a faster-than-expected economic recovery and continued monetary easing, delays in social security reform continued to weigh on investor sentiment in Brazil. The Mexican market, however, was one of the worst performers, both in the region and globally, on resumed interest-rate hikes in December and uncertainty in the NAFTA (North American Free Trade Agreement) renegotiation process. A double-digit gain in December following the election of Sebastian Pinera as president, coupled with appreciation in the peso and higher commodity prices, drove gains in the Chilean market. Central European markets including the Czech Republic and Hungary performed well, supported by generally solid macroeconomic fundamentals. The Russian market was largely driven by higher oil prices and a larger-than-expected interest-rate cut in December, while depreciation in the lira limited Turkey’s returns in US dollar terms. South Africa was one of the best-performing markets in Africa, driven by hopes of a change in policy following the victory of pro-business candidate Cyril Ramaphosa in the ruling African National Congress presidential elections, as well as strong appreciation in the rand. The Egyptian market, however, declined despite improving macroeconomic fundamentals. Frontier markets as a group lagged their EM counterparts over the three-month period. Vietnam and Kazakhstan were notably strong performers, while Argentina and Kenya also recorded positive returns. The Vietnamese market was among the top-performing markets globally, driven by continued foreign investor interest and strong macroeconomic fundamentals including robust economic growth. In contrast, equities in Kuwait and Sri Lanka fell. Source: Based on the MSCI Emerging Markets Index versus the MSCI World Index, US dollar terms. The MSCI Emerging Markets Index captures large- and mid-cap representation across 24 emerging-market countries. The MSCI World Index captures large- and mid-cap performance across 23 developed markets. Indexes are unmanaged and one cannot directly invest in them. Past performance is not an indicator or guarantee of future performance.